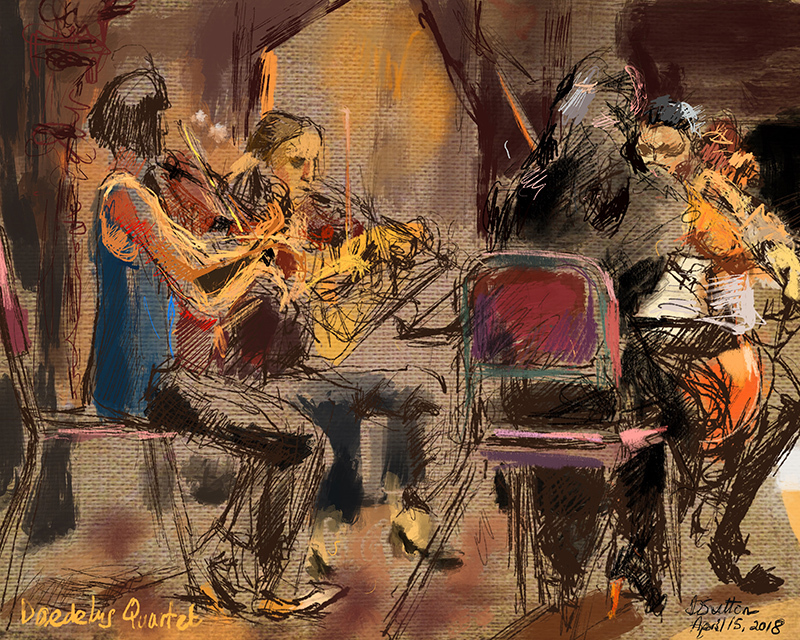 This sketch was created using an iPad Pro, Apple Pencil and Procreate app from direct observation of the Daedalus Quartet playing at the historic Kohl Mansion, part of the Music at Kohl Mansion program. The musicians featured in this drawing are Min-Young Kim, violin, Matilda Kaul, violin, Jessica Thompson, viola and Thomas Kraines, cello. They played works by composers Leos Jancek (String Quartet No. 1, “Kreutzer Sonata”), Anna Weesner (“The Space Between”) and Ludvig van Beethoven (String Quartet No. 10 in E-flat Major, Op. 74, “Harp”). I was at the concert supporting Peggy Gyulai who is this season’s Music at Kohl Mansion Painter-in-Residence and was displaying beautiful artwork relating to the music from the season, including a piece specially created in response to the Weesner’s “The Space Between”.